I know, surprise, another Mercedes post! Shoot me! 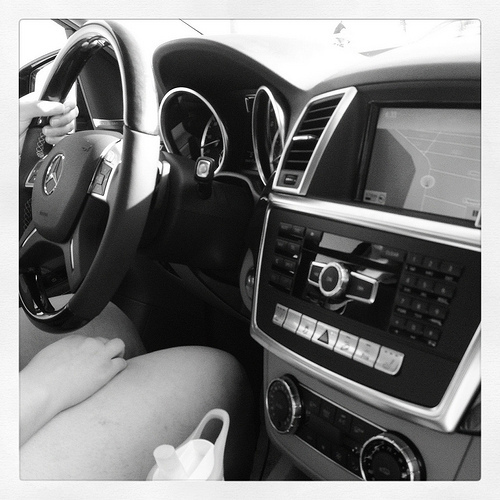 But really…I convinced a diehard 100,000 mile Lexus owner to consider Mercedes…and she did! My dear childhood friend Blair got an RX330 when we were 16, and it was the nicest car in the Plant High lot. Forty-five grand seemed like big cash back then. And it is still, of course, but now a 4-cylinder BMW 3 costs that. She drove the thing up and down the Florida interstates, back and forth to Chicago, and let her friends film homemade movies through its sunroof. By the end, the dash covering was scratched to bits thanks to her Cocker Spaniel, Tilly. It was time for new wheels. The 2012 ML is redesigned…all new. It shares parts and structures with the Jeep Grand Cherokee, but it feels honest Mercedes to me. Spacious inside, and covered in soft, nicely oiled leather, it is far more substantial and has a more assertive presence than the previous generation (2006-2011). Metallic trim actually feels like metal…and all moving bits felt hefty. I’m not a fan of wood steering wheels, but the eucalyptus trim in the ML was more interesting than standard burl walnut. A bit darker, more espresso than chocolate milk. One thing I noticed on the dash, though – the stereo still includes a 1994 9-digit touchtone keypad. Why? For nostalgia? It looks like a joke, almost. Nearly verything related to user settings or choices on the car are chosen through the rotary COMAND dial on the armrest. Why Mercedes? Back to driving. The left seat was enjoyable too, although the 3.5 liter V6 isn’t a hustler. It responds well, but throttle response is on the mushy side. You have to stomp down to set off an alarm somewhere inside it. I think it is tuned specifically for wafting…as many Mercedes are. You want to get there quickly, but not look hurried doing so. I wasn’t crazy about its bump absorption skills, but the ride quality otherwise was lovely. You’d expect that from a luxury SUV riding on 18 inchers, several feet off the ground. Maybe a shock setting adjustment would do the trick? Overall, it is a genuinely capable vehicle. Would I spend $60k on it? Yes, if it was a Bluetec diesel ML350…with the right options and a different color scheme. But for Blair, its the natural progression. Composed, safe, stylish (of course), and perfectly compliant to highway needs and ever-critical iPhone integration. Plus, she is a fledgling baker…so an expansive fold-flat rear compartment is critical. A win all around. Don’t mind if I ride shotgun again soon!